It is a violation of Federal law to use this product in a manner inconsistent with its labeling. Please read entire label before using. Use only as directed. Shake container before use. 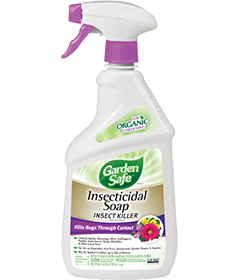 Garden Safe Brand Insecticidal Soap Insect Killer is a contact spray and pests must be sprayed directly to achieve control. Thoroughly spray insect pests or powdery mildew to wetting on all plant parts, including undersides of leaves. Repeat treatment weekly or biweekly if needed. May be used on edible crops up to and including day of harvest. Do not use on sweet peas, nasturtiums or delicate ferns. Use with care on new seedlings, transplants and blooms. Avoid spraying during full sun. If concerned about sensitivity of plants, apply to individual plants or small areas of plants and wait to determine if plant damage occurs prior to treatment of larger areas. Garden Safe® Brand Insecticidal Soap Insect Killer will control powdery mildew and listed insect pests such as: adelgids (woolly aphids), aphids, earwigs, grasshoppers, lacebugs, leafhoppers, mealybugs, mites, plant bugs, psyllids, sawfly larvae (pear and rose slugs), scale insects, spider mites, tent caterpillars, thrips, whitefly. For use indoors, outdoors and in greenhouses on: fruit and nut trees (e.g., apples, cherries, peaches, pears, pecans, almonds); corn; soybeans; melons; tomatoes; vegetables (e.g., beans, cabbage, cucurbits, peas, potatoes); figs; small fruits (e.g., grapes, strawberry, raspberry); citrus; houseplants; ornamental and bedding plants; ornamental and shade trees (e.g., birch, evergreens, holly, oak). PESTICIDE DISPOSAL AND CONTAINER HANDLING: If empty: Nonrefillable container. Do not reuse or refill this container. Place in trash or offer for recycling if available. This product may be hazardous to aquatic invertebrates. To protect the environment, do not allow pesticide to enter or run off into storm drains, drainage ditches, gutters or surface waters. Applying this product in calm weather or when rain is not predicted for the next 24 hours will help to ensure that wind or rain does not blow or wash pesticide off the treatment area.